We throw a lot of big parties - graduations, etc - and this is the first time we've had catered food delivered. The girls and I said how relaxing it was to spend the day before just decorating and making a couple treats we wanted, compared to all the cooking we usually do. Catering like this is definitely the way to go! Everything was *AMAZING*!!! Guests went back for seconds - which in general doesn’t happen at a Shower! We received many, many compliments on the food. 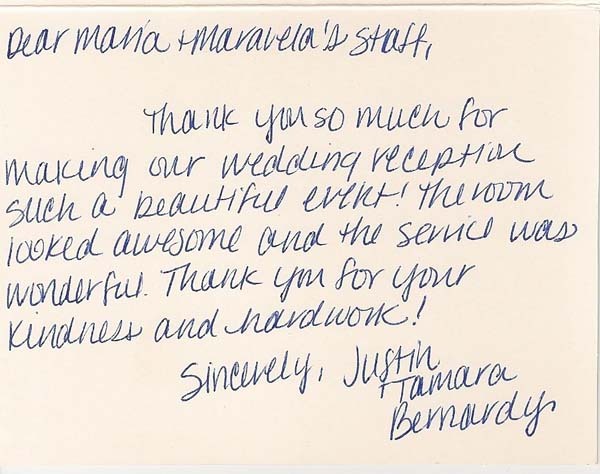 We told everyone it was Maravela's, and several guests who were at Haley and Cody’s wedding talked about how fantastic the buffet was at the wedding. Overall, a great meal for us to serve and many compliments on your business. Thank you for helping make our wedding so amazing! Your food is absolutely delicious and the fact that we have such an awesome group of people to work with and delicious food for such a great price, even with traveling outside your service area, is so very much appreciated. Thank you! Thank you! Thank you! Thank you cannot express how awesome catering our wedding on August 19, 2017 was. The food was divine and the servers were exceptional. Everything was outstanding. Thank you for all for making my special day even more special. We wanted to say a HUGE thank you for catering our daughter Hannah’s wedding. The food was delicious – several people remarked on how good it was. 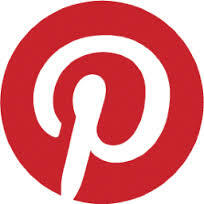 Also the service – Jodi, you and your team was fantastic. You all worked so efficiently and unobtrusively. It has been a pleasure to work with you throughout the planning. I will definitely be recommending Maravela’s. Your attention to detail and delicious food made Meghan’s bridal shower a wonderful beginning on her wedding journey. All of our guests had a very nice time. I want to thank you for helping make our daughter's wedding such a lovely success. The food was great...the service at the reception was perfect...every staff person was friendly, helpful and professional. As the default "wedding planner" I especially appreciated your prompt, courteous and helpful responses to my many questions! You never made me feel like my questions were insignificant. The reception was well organized and fun, in large part because of your involvement. Thank you for doing your jobs so well. You have a lot to be proud of at Maravela's! I was really pleased with everything on the 22nd, and have already recommended a few friends your way. Thank you again for making our day so smooth and special. Thank you for a lovely evening. We received many comments about the great food. 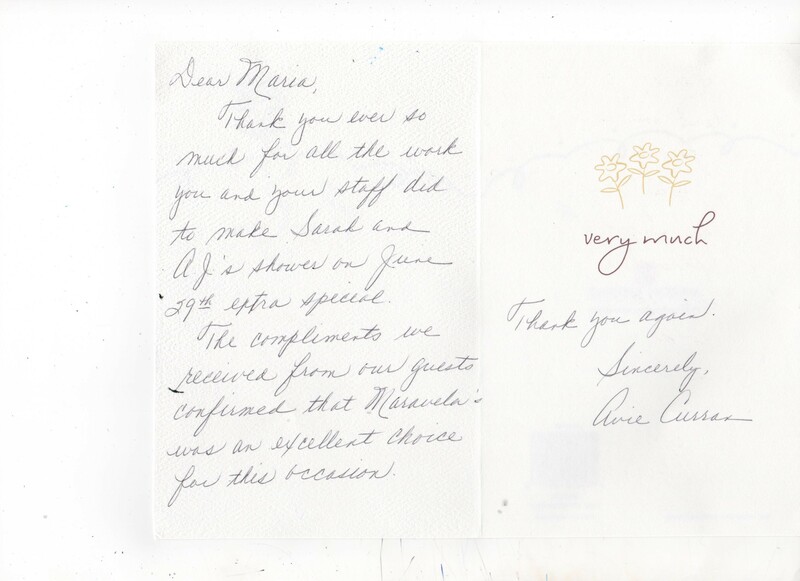 We were pleased with every aspect of our experience with Maravela's. Thank you for everything you did to give our daughter a beautiful wedding celebration. I just wanted to let you both know that our luncheon was wonderful. Had LOTS of comments on how great it was. Thank you for taking care of us and offering us the space in house. I know we are a smaller crowd for you, but it was really nice to be able to come back to Maravela's. I hope we can plan another lunch next year with you. I commented to David that the ice cream was so creamy and wonderful and he said you made the ice cream????? Unbelievable. You did an awesome job and I wish you all the success. I know you will be just great. Thanks again. 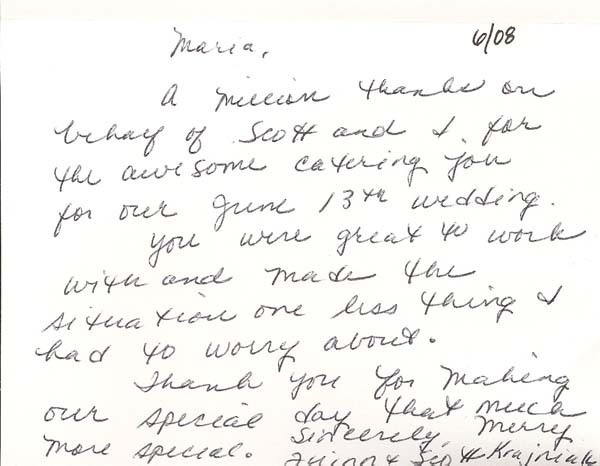 Thank you very much for the wonderful sercice your team provided us for our May 1st Wedding. The setup of the beautiful tables, the most excellent and friendly bar service, the amazing food, and the professionalism if your staff is a testament to your team;s excellence. We would like to especially thanks Patrick for his help and flexability with our event, as well as Kafi for ther assistance and patience in planning our event. Thank you for making our day completely stress free by providing us with first class service from you and all of your staff. The food was absolutely delicious- people are still talking about it! And thank you fro the beautiful bouquet of flowers, the cute teddy bear and for sending us our cake topper. Your banquet hall has always been our favote place when planning events and will always continue to be. Thanks you so much for your service on our wedding day! Everyone did an amazing job and appreciate everything everyone did to ensure our wedding went smoothly and beautifully! Thank you for another wonderful event! Maggie and Dan felt that everything went perfect on their special day and we have you to thank! You and your staff were wonderful and we had complete confidence in you after you handled our previous two daughter's weddings. So thank you very, very much! My family and I used your facilities last week at my brother's wedding. I am 9 months pregnant and we have another little one (19 months old) so needless to say, I was a little concerned with how well the evening was going to go given our personal circumstances. Trying to get a toddler to stay up late, eat dinner, and still be polite around everyone else is in a strange environment is taxing to say the least - add that to the fact that I'm full-term pregnant! Yikes! So I just wanted to express my personal gratitude for the amazing service and special accommodations we received for the little ones. Having the high chair, fresh fruit, chicken strips, and french fries made a huge difference! And because my little one was able to get a full meal that she loved, she was so much happier for the rest of the evening and even busted some moves on the dance floor! So thanks again! I never expected such accommodations and we were able to enjoy my brother's wedding that much more because of it! You guys are amazing! I just wanted to let you both know that our luncheon was wonderful. Had LOTS of comments on how great it was. Thank you for taking care of us and offering us the space in house. I know we are a smaller crowd for you, but it was really nice to be able to come back to Maravela's. I hope we can plan another lunch next year with you. I commented to David that the ice cream was so creamy and wonderful and he said you made the ice cream????? Unbelievable. You did an awesome job and I wish you all the success. I know you will be just great. Thanks again. Thank you so much Maria for everything, everything was absolutely PERFECT every-thing was exactly the way I wanted it. I couldn't of had it any other way. Everyone loved it. Once again thank-you for everything. I just wanted to let you know that everything was great for yesterday's event. Your staff was friendly and helpful, they really exceeded my expectations. Give them kudos! 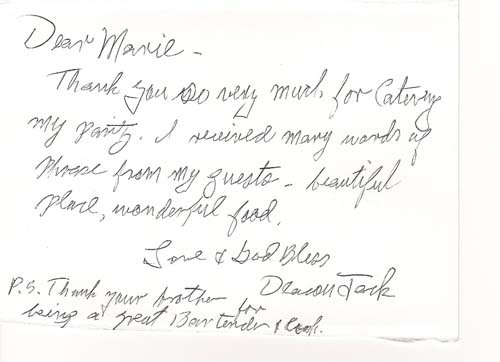 Mark & I just wanted to thank you and your staff for giving us a wonderful and very memorable wedding reception. It was perfect!!! Everything went smooth. The food was amazing and we have heard many compliments from our guests as to how wonderful the food was too. Thank you for putting everything together and making sure that it went well. We couldn't have asked for anything more. I just wanted to say thank you so much for everything! Modesto and I had such a wonderful night! Everything came together so beautifully and we couldn't of been happier! I wanted to take the time to thank you and all of your staff for the fabulous work and service you did. We had an amazing time. My daughter enjoyed it so much. She said her dream came true and it was exactly how she imagined it to be. All the guests were so happy with the service from your staff. Everyone said the food was amazing!!! I can’t thank you all enough for all your help on this special event for my daughter. Maravela’s is the BEST!!! Thank you, thank you, thank you!!! Just a quick note to say THANK YOU to you and your staff for an excellent event last evening, celebrating Lions Club of Grayslake 75th Anniversary! Everyone enjoyed it and had a great time, again thanks to Maravela's. We appreciate everything that was done to make it a successful event. Just wanted to thank you and your staff for another wonderful event. They all did an awesome job! Food was wonderful, staff courteous, everything was great! 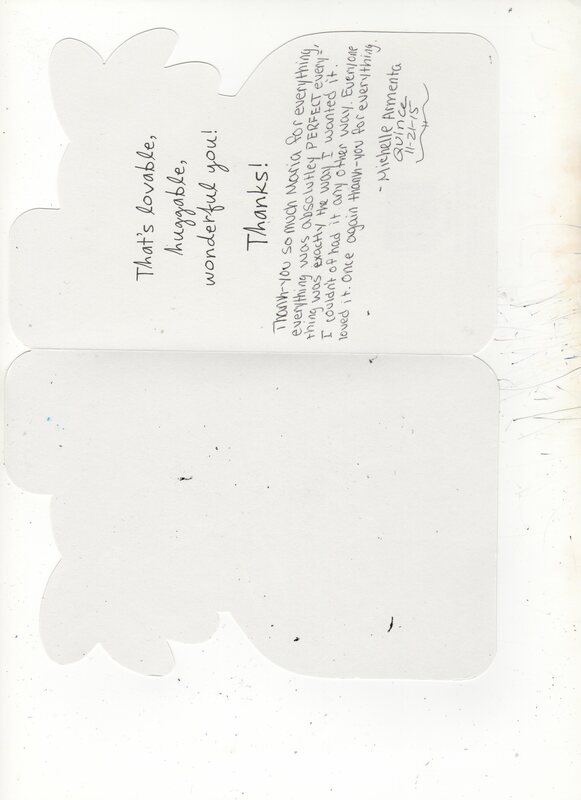 Just a quick note of thanks and kindness on glitches -- which all weddings have somewhere along the lines. I loved working with you, and the food quality was excellent! Thank you so much for helping to make Lizzy's wedding a wonderful success. The food was delicious..... many wonderful comments. We first praise our wonderful Lord and then thank each who make this wedding awesome. Thank you Very Much!!! Everything turned out excellent!! Everyone was very happy with the food and everything else. YOU and all your staff are Awesome!! Thank you Thank you!!! Thank you so much. The food was excellent. I recommended you to the parents for graduation and team dinners. You guys did a fantastic job. Thank you again! It was the most delicious food, the special dinners for our gluten free and vegan family was perfect. Everyone commented on how excellent the food was and the service. Your chef and Eli and Cat were great. Please tell them I apologize about making them wait for a tip. This is all new to me and I wanted to make sure I did the right thing for them. I have a friend who works in the catering business and we wanted her take on what to give. Honestly they were so great I had to hug them all. Many people were asking who catered and we were happy to tell them. People need good food, good drink and lots of fun. You were a Huge part of that. A BIG THANKS for making it a great day. No rain or snow or cold put a damper on our day. Be proud of yourselves in every way. I just wanted to drop you a line to say "THANKS." Everything was perfect and the food was outstanding. Your entire crew--Patrick, Emanual, Zach, Kala and Brittany-- did an awesome job for us and we really appreciate it. I even introduced them at the event and gave Maravela's a plug. Thanks for making everything so easy. Take care and if we have another party--you're our 1st choice. Thank you so much for making our daughter's wedding extra special. You are a caring and giving person who truly does her best to make every detail memorable. Thank you so much for making Meagan and Tacito’s Wedding SO special. In a word: PERFECT. You are amazing. Everything was so beautiful, so well-coordinated and the food was phenomenal. The service your team provided was TOP NOTCH. From the first meeting to packing up the last box I could not have been more pleased and impressed with how professional you run your business and how incredibly helpful you have been throughout the entire process of planning Meagan’s wedding. THANK YOU THANK YOU THANK YOU! I just wanted to drop you a quick note to let you know that you received quite a few compliments on the catered food. Lots of rave reviews on the marinated chicken breast, Italian beef and rolls! I’m so glad we chose Maravelas. It made my day much more enjoyable. Thank you so much for making our wedding day special! Everything was wonderful and because of you and the staff I had no worries during our receptino! You were a blessing to work with and I look forward to attending your hall in teh future!. We wanted to thank you for all of your help. Our wedding wouldn't have been as beautiful as it was without all of your dedication. It turned out perfect, and all of our family and friends enjoyed it so much. I was blown away by your proffessionalism, your dedication and all of your help. I really appreciate everything you did, it all flowed so smoothly. I'm beyond impressed! Thank you from the bottom of our hearts. Bob & I can't thank you enough for the wonderful reception! Everything was perfect! The food, the service, just everything. They were so happy and all of the guests were raving about how tasy the dinner was. Coming to Maravela's for our Katie's wedding was the best decision we could have ever made! Thank you again and again! Thank you so much for catering our special day. Everything was soooo good and our guests were thrilled with the menu and how great everything tasted! We can't thank you enough for everything you all did! We are sooo happy with the way the room loked, the food tasted, and most of all, all your help throughout this wonderful process. You will be forever in our hearts. We just wanted to thank you so much for doing such a fabulous job for our baptism! It was a wonderful day, and everyone raved about the food. You are awesome and we really appreciate all of your hard work! Thank you so much for making the most beautiful day perfect. We could not have asked for a better wedding thanks to you & your team. words can't even fill how thankful we are. 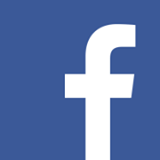 We can not wait to send referrals your way. Thank you so much for the wonderful food and service you provided. Maria, you were a pleasure to work with and immediately made us feel comfortable and confident that Maravela's would do a stellar job. And you certainly delivered! Thank you for the elegant taste testing experience. I am so very pleased with your expertise and help with our special celebration. I feel so very confident in your very professional direction you are giving us. I am your forever commercial for your excellent service. 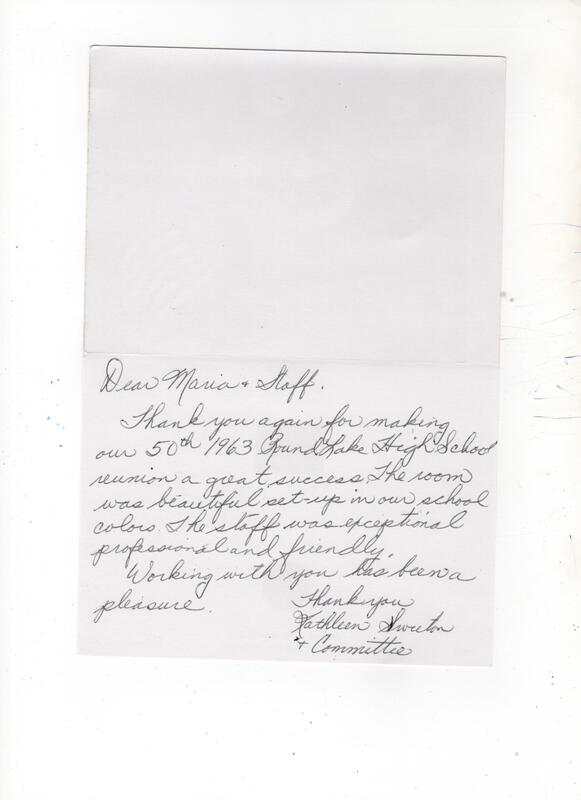 Thank you again for making our 50th 1963 Round Lake High School reunion a great success. The room was beautiful set-up in our school colors. The staff was exceptional, professional, and friendly. Working with you has been a pleasure. Thank you for all your hard work in preparing and serving such a wonderful meal at our wedding. We are so very thankful for all your hard work to make our wedding a dream come true. Thank you so much for helping us plan and celebrate our big day. We couldn't have done it without you. Our special day was made even more special by you. Thank you so much for all your help. Dinner was delicious. We appreciate all of the help that you provided by catering our wedding. Thank you for the great food Friday! It was one of the best picnics we’ve had!! Your staff is very efficient. We would like to thank you and your wonderful staff at Maravela's for providing such a pleasurable evening July 13th. You all were so warn and friendly and you made sure our needs were met. The food was delicious! We received many compliments. Thank you ever so much for all the work you and your staff did to make Sarah and AJ's shower on June 29th extra special. 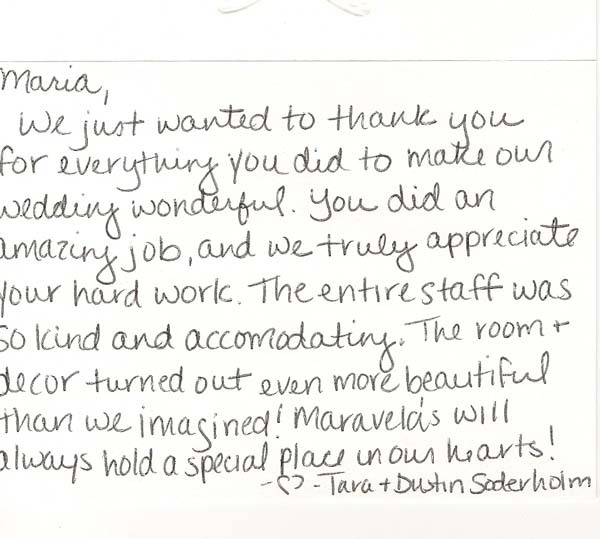 The comliments we received from our guests confirmed that Maravela's was an excellent choice for this occasion. Thank you so much for all your help through the planning of our special day, you make planning a wedding seem so easy. Thank you for your flexibility and all that you do. Just wanted to let you know what a wonderful Wedding we had!!! Your people were amazing and on top of everything. Thanks to you and all of them. So many people were like who did you hire the food is so good and they worked so hard. As you well know word of mouth is the best advertising and I do believe you will get it out of this Wedding. I do have one table cloth that was left on the high boy and one wine glass. I will leave them on the front porch in case we are not home at the time you come by so fill free to come when ever. From the very minute that you sat down at our table to the tasting and theWeddin you have made this so easy, taking all the weight off our shoulders and allowing us to enjoy Danielle and Tom's Wedding. Thank you! Thank you! Thank you! What a great meal tonight. Thank you very much, everybody raved about the food. I will have next Friday' menu to you on Monday. The wedding went beautifully on Friday! All of the guests had nothing but wonderful things to say, especially regarding the food and service. Thank you so much! I really appreciate how organized and responsive you've been throughout this whole process. I will definitely be referring you to my friends as they begin to plan their weddings! I just wanted to say Thank You for another wonderful event. As usual, Patrick was very friendly and efficient. We appreciated everything. This is a long over due email to THANK YOU for the suggestions to the menu. The Greek salad, pasta salad, chicken and mostaccioli were a hit - the Greek salad was devoured and people were so energized about seeing so many salad choices. I am not sure what Maravella's uses to transform ordinary chicken into the best tasting chicken I have ever had, but I would be willing to pay for that recipe! There was none left over for me to take home! 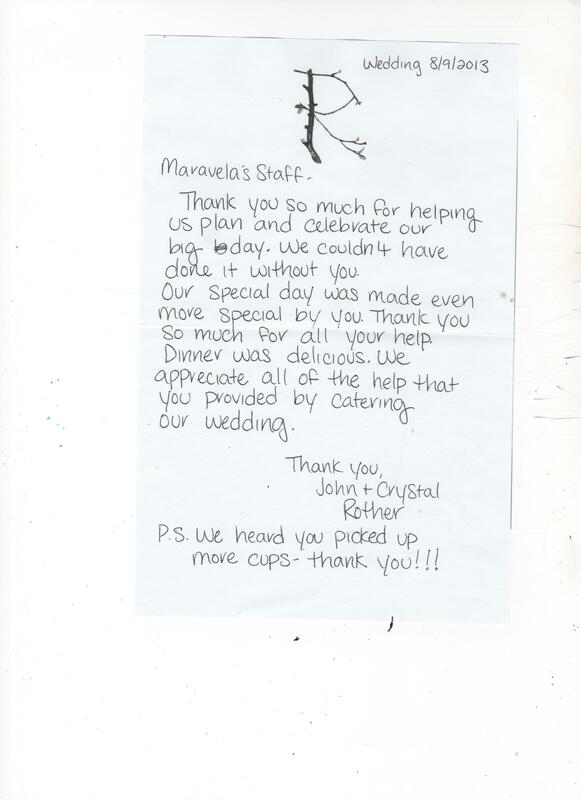 Thank you very much and we look forward to having Maravella's cater our next event. I can't thank you enough for your excellent food and service. Everyone at the party thought the food was terrific. Spiro and Kalie worked very hard. Kept everything going. Two of my friends are great cooks and thought it was the best beef they ever had.. I would highly recommend using Maravel's. Maria helped plan everything. She is wonderful. I can't say enough about everything.. Don't even consider going anywhere else. And don't skip the green beans. I love the green beans. You are wonderful. Hank and I Thank you very much and so do our guests. The party was great because of you. I just wanted to let you know what a great job today. The food was great the presentation was fantastic. Everyone LOVED IT!!!!!!!!!!! We had rave reviews about the food from our guests, the microphone worked great (none of the halls I’ve been in have had even decent systems), the room was lovely and comfortable. HUGE thank you, we’re so pleased. Let everyone know , we extend our appreciation to everyone involved, especially behind the scenes! A "Big Thank You" for another awesome job your staff provided for us on Saturday afternoon/evening for our daughters' wedding shower.The food was delicious and plentiful and Patrick did an excellent job serving and keeping our home cleaned up. Our guests complimented the food and service all evening! We are your Loyal clients and friends. If you should ever need a referral we are always there for you! I just wanted to thank you for the amazing job you all did for our wedding in October! We were so happy with it all! It was absolutely beautiful! Your staff was great as well. We had so many people complimenting on how great the food was and how nice everything was set up! I will definitely refer people to Maravela's anytime. Thank you again for making my dream wedding come true! We just wanted to let you know how wonderful every thing turned out Friday. I had several people compliment your staff on how quiet they were setting up for lunch, since it was in the same room as the talks, it was greatly appreciated. They were very helpful and congenial. The food was great, everyone left with nothing but compliments. Good Job!! Maravela's did a wonderful job catering my cousin Ruth's funeral yesterday at Shepherd of the Hills Lutheran Church. 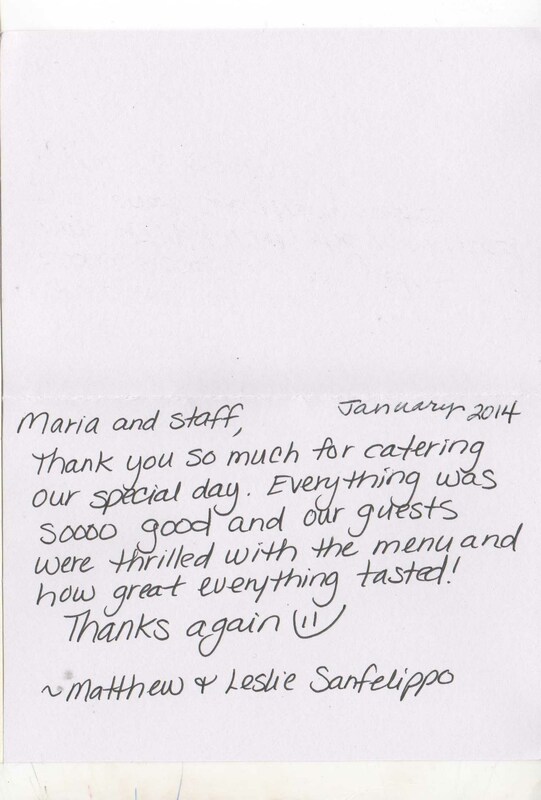 The food was great, service impeccable and Patrick added to the occasion with his professional demeanor and attitude. We were all pleased with the service you provided. Thanks to everyone at Maravelas for the great service and food for the Republican tribute to Jim. It was a great night for all who attended and the food was excellent. Thanks again! I would like to thank you and your staff for the wonderful job you did at our 10th anniversary cocktail party. The appetizers were simply delicious! We had so many positive comments about the food and the wait staff, and this made the event memorable. Barbara and I also appreciated your coordination at the event, which allowed us to fully enjoy the party. Thank you again for your time and effort. We look forward to using Maravela's for more events in the future! TThank you so much for everything you did for us! You made our day amazing and so did your staff. The place looked amazing and the food was great. You made me feel at ease. Thanks for your kind words when I was so nervous to sing. Our family loves having events at Maravela's. You guys are so professional and amazing at what you do. Thanks again Maria. I will never forget this magical day! We will recommend you guys to everyone. Fremont Township would like to thank you for catering the Lake County TOI dinner September 25, 2012. The food was excellent and the service was outstanding. Maria was extremely helpful in assisting to set-up the event. Patrick presented the dinner beautifully and guided the event to a successful conclusion. Jeff and I just wanted to thank you for how absolutely fantastic everything came out yesterday! Your servers and bartender were absolutely perfect and did a great job! The food was delicious, and we got numerous compliments about how great the food was! Words cannot express how absolutely amazing everything turned out! Please make sure your staff knows how excellent we thought everything was, and how glad we are that we chose you to cater our wedding! We couldn't be happier! Although it is very delayed, I wanted to take the time to thank you and your staff for the remarkable work you did for my husband's and my wedding reception. 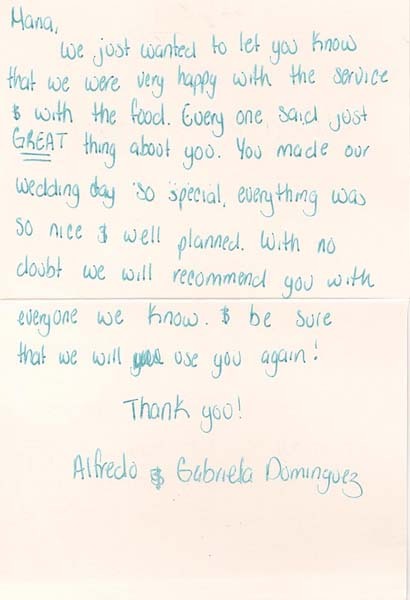 We were married in April of 2009 and our guests still discuss the wonderful food, courteous staff and the beautiful decor. And trust me when I say the food is discussed on a regular basis (that was the most delicious steak ever)! 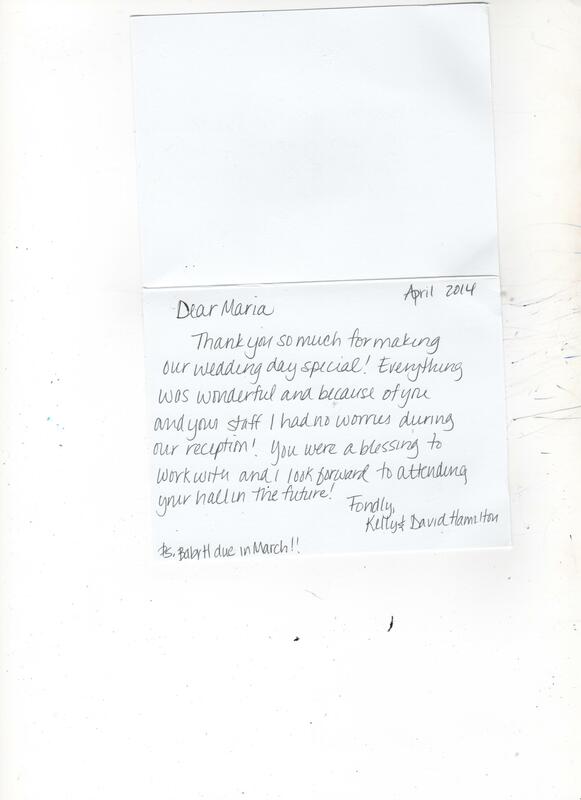 I think of Maravela's often and how helpful and reassuring you were in planning a reception from 1000 miles away! 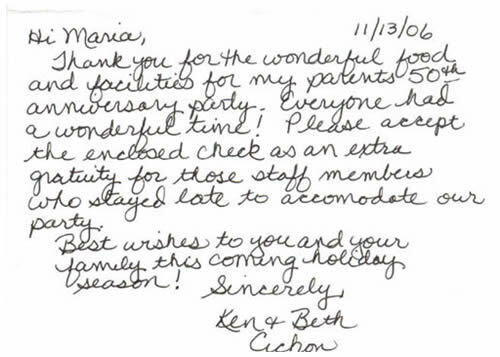 Thank you for taking extra special care of us and our guests. You made our reception an affair no one has forgotten. I want to send you a note expressing my thanks for everything you did to make Emily's and Erick's wedding celebration so beautiful! All our gests raved about the food, the servers, and the hall. Everything was perfect! I would not have changed a thing. Maria, you were wonderful to work with. As you know, we considered several other halls. No one could even come close to the fantastic price you offered, and working with you was an added bonus! Just a note to say thank you so much for making my Graduation Dinner Party a great success! 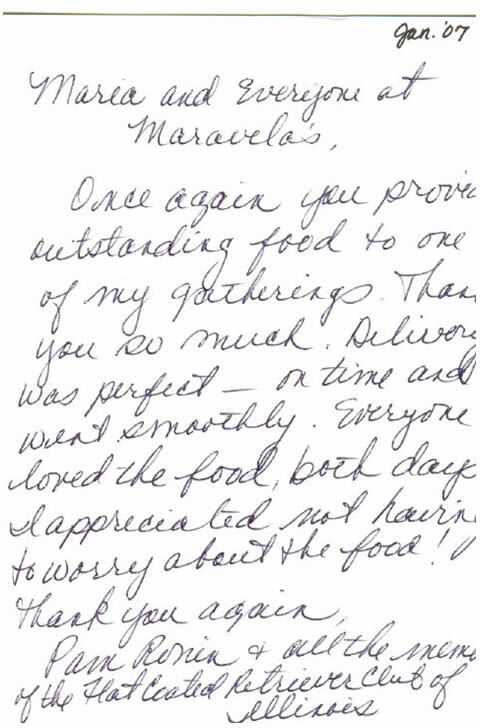 I want you to know your personality and service to the customer each and every time is what has made Maravela's a household name in our house whenever we think of a catered event in our family! Your Staff did a wonderful job as well. The reason you know that is because your event goes off without a hitch and they just blend in. Thank you for making Chuck's 90th party so fun for us. Thanks to you and your excellent staff our 50th anniversary luncheon and celebration was a huge success. The tables looked beautiful and the food was delicious. You were a delight to work with and I thank you for that. Brandy was super too. Kudos to all of you for a job well done. Hope you had a great vacation? Mike and I would like to extend our sincerest gratitude and thanks for your help in making the party a great success. Everything went smooth, and just could not have been better. The food was delicious, and your staff did a superb job from the time they arrived until the very end. Please extend our heartfelt thanks to Patrick and his staff. They were wonderful! It was a pleasure working with you, and hopefully will be able to work with you again in the future. 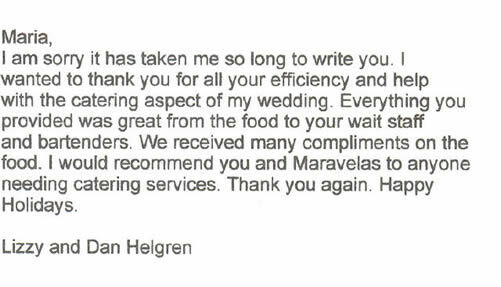 We will not hesitate to recommend Maravela's in the future to anyone looking for a caterer. Thanks so much for another wonderful banquet for the Blue Devils Swim Club. It was another fun event and everyone remarked how impressed they were with the hall and food. Thanks so much for making it such an easy process, too. Everything was taken care of and the service was excellent. We look forward to next year's banquet. I just wanted to say Thank You for such a wonderful catering job. Our caterer Patrick was fabulous! He tended to our every need! The food was great and the home-made marinara sauce on the mostaccioli was the best! Everyone at the event, had a great time and loved the food. We will definitely have you back next year! Dear Maravela's, I wanted to thank you all for a job well done. I had a surprise birthday party for my husband and the server had everything laid out and everything looked beautiful but not only did the food look beautiful it was absolutely delicious. Our servers name was Patrick and I certainly wanted to commend him because he was so very professional. Everyone absolutely loved the food and the whole entire presentation and service was truly worth five stars. God bless you all and thank you for making my husband\'s birthday that much more of a success. Thank you so so so much for all you did Saturday night! I could not have asked for a better time! Maria, you are fantastic and a pleasure to work with!!! I will recommend Maravela’s to anyone!!!!!! 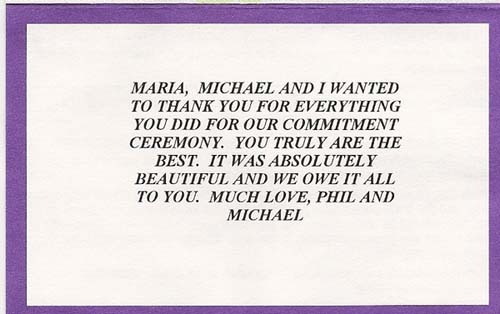 Maria---- your staff, Patrick & Rhonda... AMAZING!!!!!! The food was WONDERFUL!!!!!!!!!!!!!!!!!!!! We cannot thank you enough for helping us to celebrate our anniversary--- everyone said they had such a great time, and the servers were absolutely wonderful!!!!! Helpful!!!!! Happy!!! Professional!!!!!! THANK YOU... from the bottom of our hearts!!!!!! I recently had an wedding picnic reception at my house. i was the best event i have ever put on thanks to your outstranding service and food. i got so many compliments on how wonderful the servers were and how good the food was. i really appreciate your excellent catering service. many people asked for the servers names so they could serve at their parties. Thank you again for everything you did for me and my guests on Sat during my event. This is long overdue. 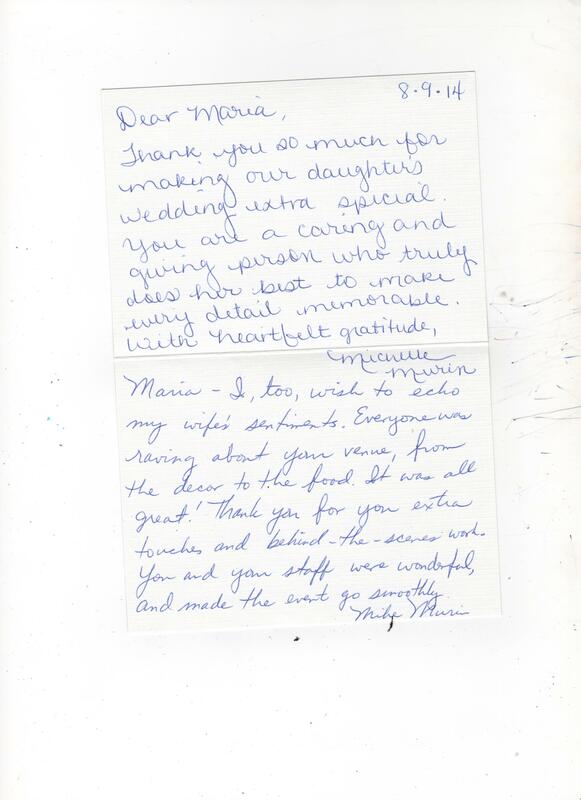 I wanted to tell you what a wonderful job you and your staff did for our daughter’s wedding. She and Chris could not have been happier. The hall looked beautiful when they arrived, the food was outstanding, the staff accommodated our every request and you were wonderful. We could not have planned a more perfect day. Thank you from the bottom of our hearts for making July 24, 2010 such a wonderful memory for so many family and friends. Hello Maria. 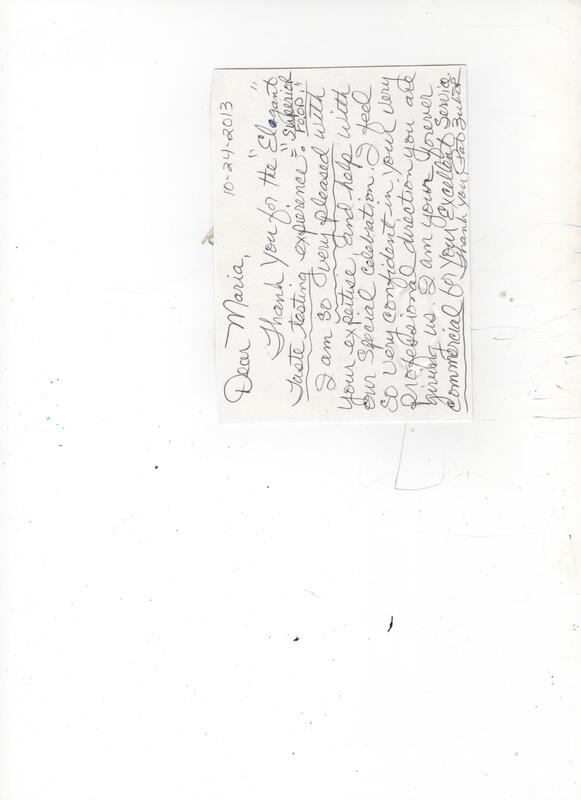 I would like to compliment you and your staff for an outstanding job. The food was awesome. Everyone at the party raved about the appetizers! I gave your name out ot several people who wanted to know who made the food. I hope you will get some business from them. The whole party was great. My Mom loved it. Thank you again!! Steve and I want to thank you so much for catering for our wedding! You and your staff did such a wonderful job. You and your staff are so friendly and the food was delicious. We've had many people tell us how great the food and staff were. Thank you for being so accomodating and making our day that much more special! Just wanted to let you know everything worked out just great for our AARP picnic yesterday. Armondo was just super and did a great job setting up everything..
Food was outstanding and everyone enjoyed it. Just wanted to let you know we appreciate how you accommodated our requirements. You can be sure that we will contact you first for any future events we might have. From the officers, board members and members of Antioch AARP Chapter 387. Now that the dust has settled and we are nearly back to normal I wanted to write you about your catering efforts for our bluegrass concert party. One word: Spectacular!! 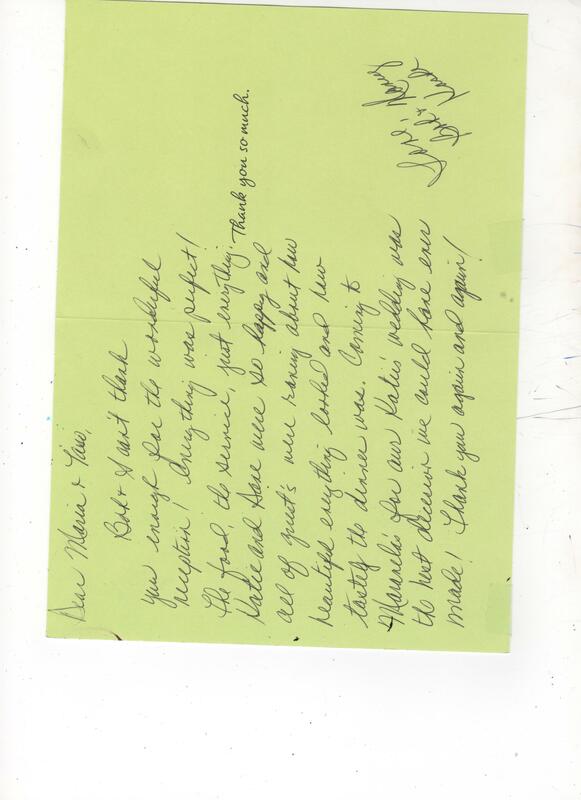 Most all of the ‘thank-you’ notes are now in and to a person they were very complimentary about the food and service. Many people took cards and asked about your service, so some referral business may come your way as a result. We had house guests after the party, and what a joy it was to wake up to a clean house and yard due to the work your team did in picking up after the party. We had some left-over desserts because about 15 guests didn’t show… so those were eaten the next day by the house guests. We hope that we were appropriate to your great workers with our gratuities and hats. We look forward to our next bash and your assistance so we can sit back and enjoy our own party. Thank you so very much for all your help and kindness! Everything was great! The food was awesome as always! Your staff were all great too! Please tell everyone thank you for all of their hard work! Everything went well! People had fun! They all complimented on everything throughout the evening. Everyone went home happy - full - & w/ lots of prizes! Your hospitality, kindness, & always going out of your way for me is always greatly appreciated! This is why I always want to come back to you! You & your staff are awesome people! Thank you again and take care! Hope to see you soon for another function! We can't thank you enough for the incredible service when you did Drake's Bar-Mitzvah. The food was great, but more importantly - we never had to ask for a single thing. The service was beyond terrific!! No guest even had to ask for anything - the day was flawless - from setup to clean up. You all did a tremendous job!! Please use me as a reference, as I have only the best to say! My guests all raved about the food! Thank you all so much for all you do, and God Bless! Thank you and your staff for your expertise and going that extra mile. We appreciate you being there and having all the answers! Thank you so much for catering our December luncheon. The service we received was exceptional and the food was fantastic. Everything was delivered on time and hot. There was plenty of food to feed our hungry crew of mostly guys. We even have leftovers for a mini lunch today. By far, this is the best food we have had catered in at the most reasonable price. We look forward to using Maravela's again in the future. Maria I just wanted to send a special thanks for all the hard work you and your crew did for us. We were extremely happy with everything!!! The food was amazing and everything was beautifully set up. Our host Mary Alice was a pleasure to work with. She always checked if we needed anything and to make sure everything was ok. What ever we needed she made sure we had it. There was superb customer service given. We had a great experience there. I felt so relaxed and never had a thing to worry about. It was all taken care of. Thank You for everything!!!! WOW!! What a beautiful job you and your staff did!! 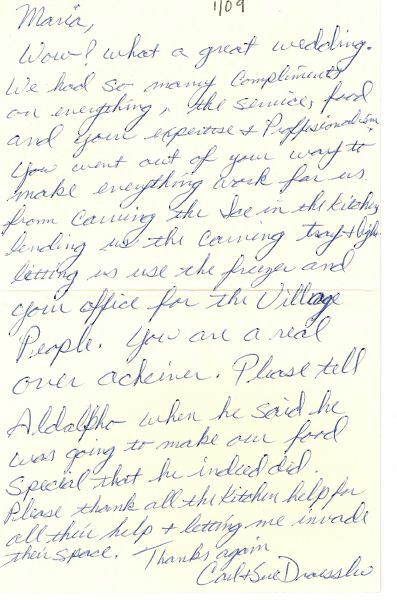 You need to know how many, many, many complements we received. I wish I could remember ALL the wonderful comments we did receive about our wedding reception. How beautiful, elegant, perfect it all was. Everything was set up perfectly, beautifully. I know you went above and beyond by even getting all the table decorations on the tables in the ‘rain’. I was very nervous in the morning, but it ALL WORKED OUT BEAUTIFULLY.. the cake, the servers, the food, ( EVERYONE commented on how good the food was). I even had the DJ tell us that he had been to a very expensive wedding reception dinner at some Marriott and our (YOUR) food was better!! Your servers were excellent, polite, efficient, top notch all the way. Carol, our bartender, AWESOME.. l loved her!!! THANK YOU MARIA!! You are a treasure! I just wanted to thank you for making Andy and Jenny\'s wedding everything you promised it would be. From the ceremony to the dance floor, from the soup to the dessert, every person there raved about the way the room looked, the organization of the reception, and the outstanding steak dinner!! I know we did not start planning this wedding for 200 until Feb of 2009, but with your help, everything went smoothly and looked as if we had been planning for years. 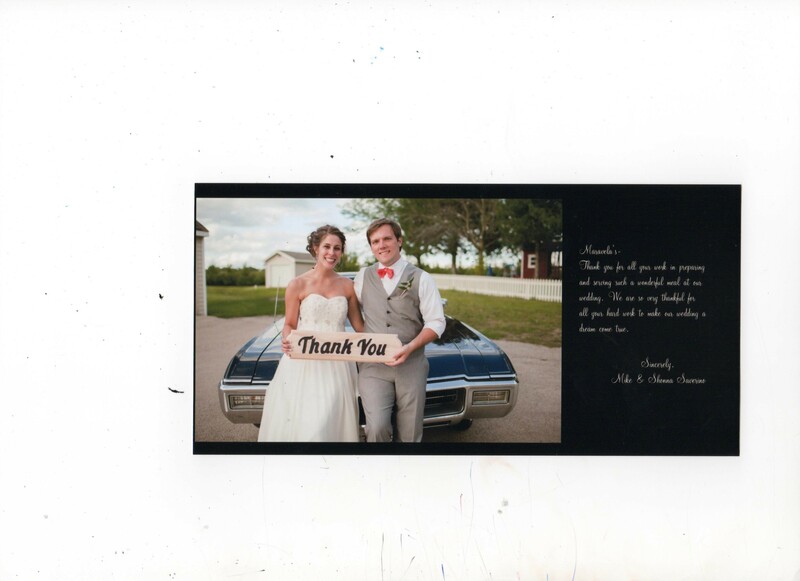 Again, you helped Andy and Jenny have a storybook wedding that they and the guests will never forget. I just want to send a thank you for the amazing job your staff and you guys did on our retirement party last night. I have been hearing compliments all day. Thanks again for everything! 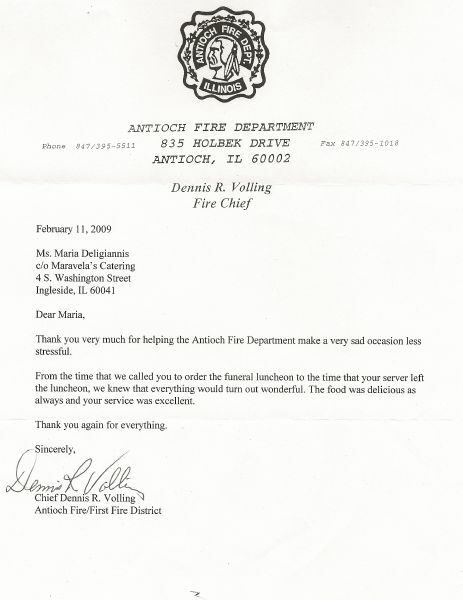 Thank you very much for helping the Antioch Fire Department make a very sad occasion less stressful. From the time that we called you to order the funeral luncheon to the time that your server left the luncheon, we knew that everything would turn out wonderful. The food was delicious as always and your service was excellent. 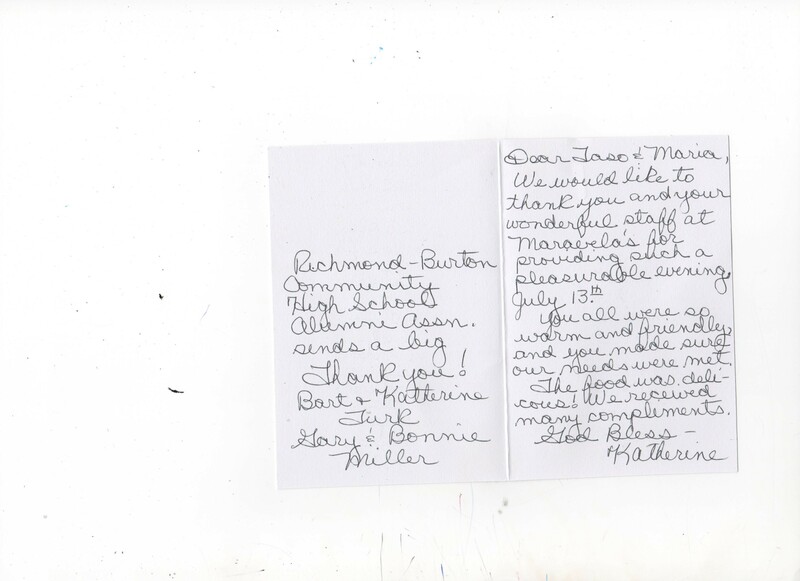 We wanted to "Thank You" again for another job well done! 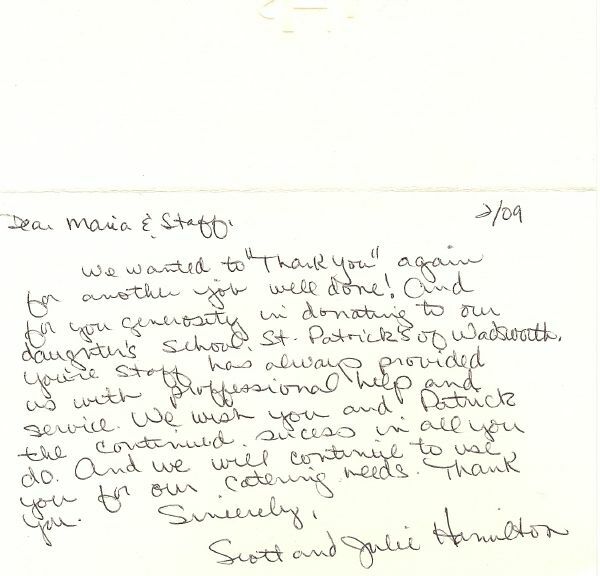 And for your generousity in donating to our daughters school, St. Patrick's of Wadsworth. Your staff has always provided us with professional help and service. We wish you and Patrick continued success in all you do. And we will continue to use you for our catering needs. Thank you. Wow! What a great wedding. We had so many compliments on everything, the service, food and your expertise and professionalism. You went out of your way to make everything work for us from carving the ice in the kitchen, lending us the carving tray and knife, letting us use the freezer and your office for the Village People. You are a real over acheiver. Please tell Aldalpho when he said he was going to make our food special that he indeed did. Please thank all o fthe kitchen help for all their help and letting me invade their space. Thank you for the excellent food you prepared for our Mexican Fiesta. We had plenty of food! Your driver was polite and very helpful and, most importantly, on time. We look forward to using your catering again in the future. 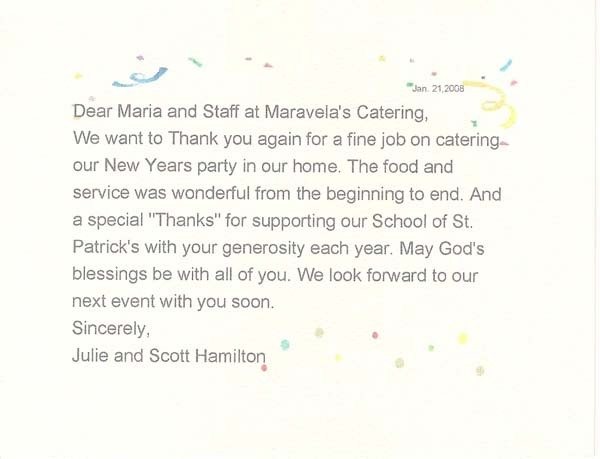 We have a December luncheon every year and are considering Maravella's for our catering. I will look at the information on your website but if you have any other information, please send it to me so I can review it. We had our event today and it was wonderful. The food was great and the service was great. We appreciate you and what you do. Thank you so much. We will definitely recommend you to others at SuperValu. Rob and I wanted to extend a great big "THANK YOU" to you and your staff. Our wedding was amazing! Everyone had a great time and we absolutely loved every element of the wedding. The food was delicious, the wait staff and bartenders were fantastic and the decorations were beautiful. We couldn't of asked for a better time. Thank you so much for everything you did, you will always hold a special place in our hearts. Words alone cannot express enough gratitude for the catering and bartending services that you provided for our Wedding Reception!!! From the first meeting with you, we were amazed by your professionalism, knowledge, and confidence in your services!!! We knew at that moment, there was no need to look elsewhere for catering service(s). Your Staff is exceptional…they were extremely attentive throughout the entire evening!!! The Bartenders had great personalities and were so much fun!!! Please pass this along to all of them!!! We strongly encourage all couples looking for catering services on their Special Day to take you into the utmost consideration; as they will be deeply touched for the rest of their lives!!! Words can't express the gratitude we have for all you have done for our daughters wedding at the Barn 8/22/08. From the first day we met you we felt confidant in having you cater the wedding. We had so many compliments on how great the food was. We also enjoyed it for our opening of the gifts. A million thanks on behalf of Scott and I for the awesome catering job for our June 13th wedding. You were great to work with and made the situation one less thing I had to worry about. Thank you for making our special day that much more special. Just a note to again thank you so much for the awesome quality you gave to Becky & Darrell's wedding. Your food was outstanding and your staff was awesome. So helpful. I had several people tell me your food was the best they had ever had at a wedding and I gave your name as a referral to several people. It was my pleasure to deal with you service for my daughters special day. 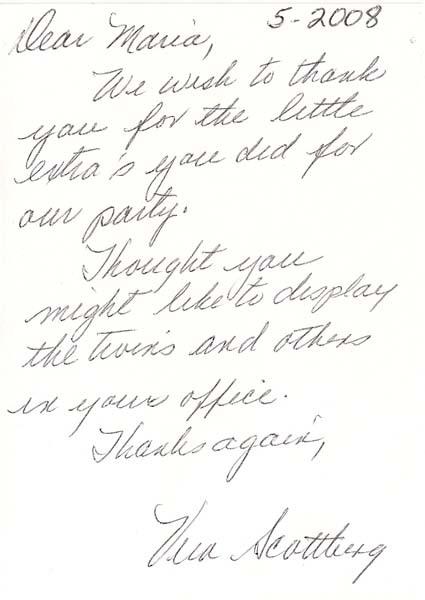 We wish to thank you for the little extra's you did for our party. Thought you might like to display the twins and others in your office. 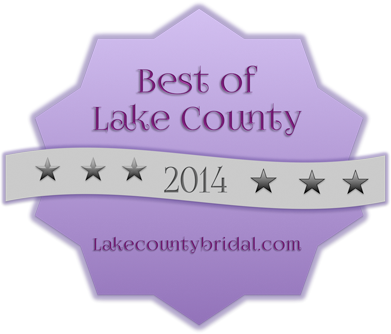 On behalf of the Lake County Association for Home and Community Education, thank you. Our meeting yesterday was a great success. Everyone loved the place and ease of getting in from the parking lot. Your food excellent, the servers were so kind and pleasant. On the evaluation sheet that was mentioned many times. The room looked so lovely with all of the spring colors. Napkins in glasses made a Lit. different and colorful. We want to thank you again for a fine job on catering our New Years Party in our home. The food and service was wonderful from the beginning to end. And a special "Thanks" for supporting our School of St. Patrick's with your generousity each year. May God's blessings be with all of you. We look forward to our next event with you soon. 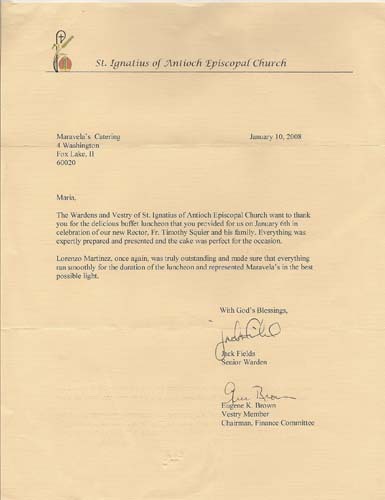 The Wardens and Versty of St. Ignatius of Antioch Episcopal Church want to thank you for the delicious buffet luncheon that you have provided for us on January 6th in celebration of our new Rector, Fr. Timothy Squier and his family. Everything was expertly prepared and presented and the cake was perfect for the occasion. Lorenzo Martinez, once again, was truly outstanding and made sure that everything ran smoothly for the duration of the luncheon and represented Maravela's in the best possible light. Once again you provided outstanding food and service to one of my gatherings. Thank you so much. Delivery was perfect - on time and went smoothly. Everyone loved the food, both days. I appreciated not having to worry about the food! Thank you for the wonderful food and facilities for my parents 50th anniversary party. Everyone had a wonderful time! Please accept the enclosed check as an extra gratuity for those staff members who stayed late to accomodate our party. Best wishes to you and your family this coming holiday season! 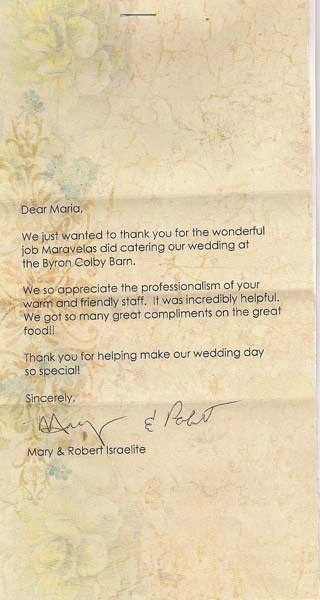 We just wanted to thank you for the wonderful job Maravelas did catering out wedding as the Byron Colby Barn. 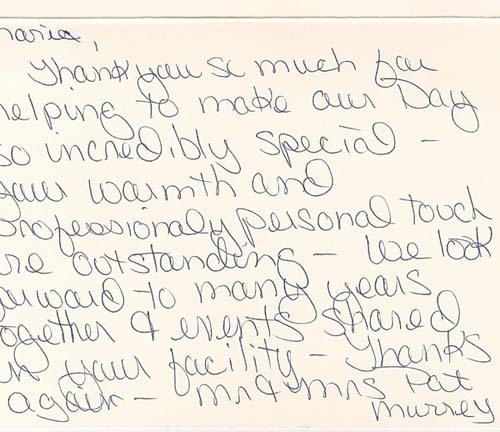 We so appreciate the professionalism of your warm and friendly staff. It was incredibly helpful. We got so many great compliments on the great food!! Thank you for helping make our wedding day so special! Thank you so very much for Catering my party. I received many words of praise from my guests - beautiful place, wonderful food. Michael and I wanted to thank you for everything you did for our commitment ceeremony. You truly are the best. It was absolutely beautiful and we owe it all to you. 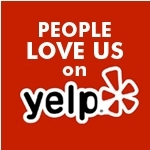 We just wanted to let you know that we were very happy with the service & with the food. Every one said just GREAT things about you. You made our wedding day so special, everything was so nice & well planned. With no doubt we will recommend you with everyone we know & be sure that we use you again! We just wanted to thank you for everything you did to make our wedding wonderful. You did an amazing job, and we truly appreciate your hard work. The entire staff was so kind and accomodating. The room & decor turned out even more beautiful than we imagined! Maravela's will always hold a specialplace in our hearts! Thank you so much for making out wedding reception such a beautiful event! The room looked awesome and the service was wonderful. Thank you for your kindness and hardwork! Thank you so much for helping to make our day so incredibly special - your warmth and professionally personal touch were outstanding - we look forward to many years & events shared in your facility. 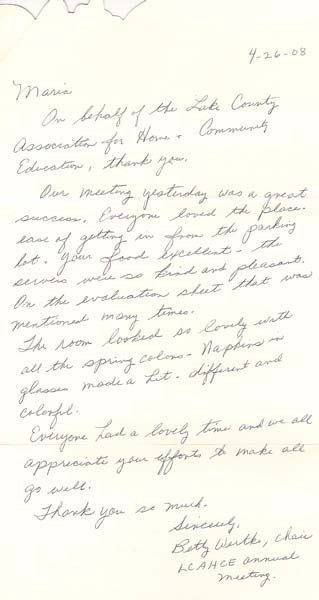 Fantastic, marvelous, wonderful, delicious - those were just some of the comments made by the people attending our luncheon. I'm not sure what I appreciate more - the quality of the food or the quality of the service. You do an outstanding job on both. The young man that does the delivery is so helpful - putting the warm food in the ovens, and the cold food on the serving tables, and he goes over every single item on the bill before he leaves. It has really been a pleasure doing business with you. Someone else will be in charge of the luncheon next year, but I will strongly recommend that they continue to do business with your company. Thanks once again for everything. You made my job so easy. I wanted to drop you a note to tell you how WONDERFUL the catering service was for my wedding. It was superb! From the food, to the dessert bar, and to the waitstaff...everything was top notch. Patrick was a wonderful captain and many, many people at my wedding said how great the service and food was...the set-up of the buffet was fantastic too and beautiful. Working with you was such a pleasant experience during a very stressful time. You covered everything...even things I didn't think of! An off-site reception for 350 poeple is no easy task...but you made me feel it was the easiest thing in the world. I am very grateful Maria. Please pass my thanks on to the cooks and everyone who wasn't able to see all their hard work come to fruition at the reception. I am sorry it has taken me so long to write you. 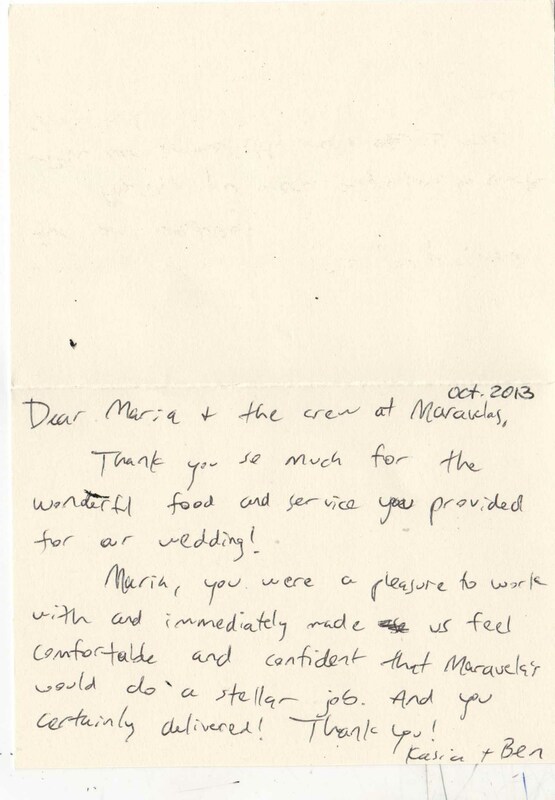 I wanted to thank you for all your efficiency and help with the catering aspect of my wedding. Everything you provided was great from the food to your wait staff and bartenders. We received many compliments on the food. I woudl recommend you and Maravelas to anyone needing catering services. Thank you again. Happy Holidays.